Here is my short bio for a long post secondary teaching career. I have joined this open, online workshop to learn more about using WordPress for my courses in conjunction with the university LMS. English faculty member at Kwantlen Polytechnic University since 1996, previously at UBC for 2 years and Thompson Rivers University for 6 years. 26 years of University English teaching experience. 12 years teaching online and loving it!! I have also become a bit of a cMoocoholic having participated in many online and networked communities with the theme of open education practices. 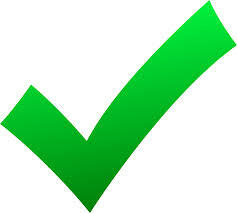 B.A. 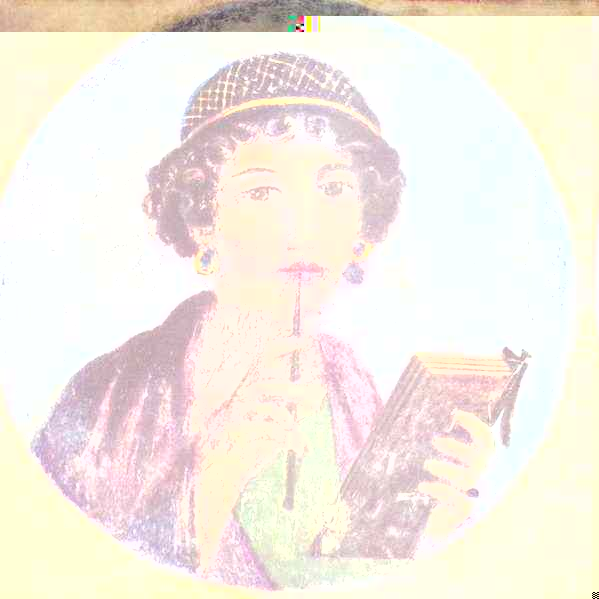 in Philosophy and English Literature (Concordia) ; M.A. in Liberal Studies / Interdisciplinary Studies of English Literature(SFU); TESOL Diploma (VCC); post graduate courses Faculty of English (UBC), Faculty of Education (SFU). International Experience: In 2012 completed a scholarly exploration of the Romantic poets in Italy with SFU’s Graduate Liberal Studies Program; I spent May, June of 2012 on an Italian journey following the footsteps of Shelly, Byron and Goethe. Conducted a seminar on ‘Goethe in Rome’. April 2013 attended The International Journal of Arts and Sciences Conference in Florence, Italy. 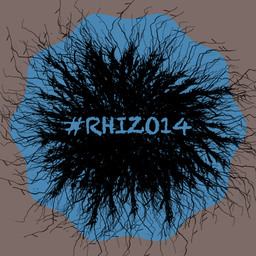 2014 and 2015 International Academic conferences in Barcelona and Rome. 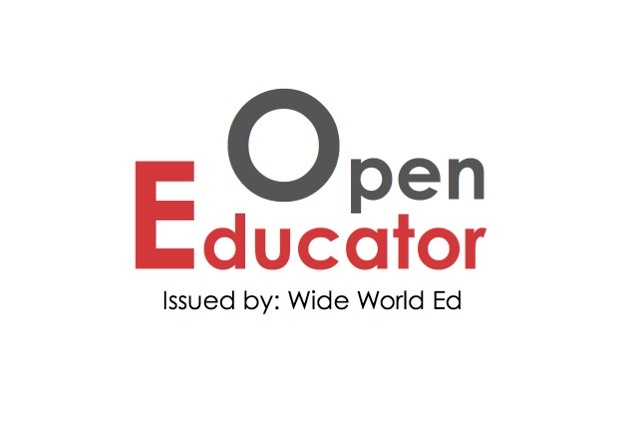 My latest open education project was as co- creator and mentor in Open Online Experience 2013 (#OOE13) which was a free, online PD opportunity in edtech for K-16 educators. Here are some of the badges I have earned in the past 2 years by participating in various online programs, seminars and Moocs. I keep these badges in my Mozilla backpack! As an instructor, I have a question about instructional designers. How does one become an ‘instructional designer’ and what are the qualifications for employment? As a faculty member for 25 years, I have designed my own courses always based on the university course outlines which have gone through the rigorous procedures of curriculum committee and Senate approval. With Web. 2.0 tools and LMS use for course delivery, it seems that instructional designers have proliferated in the educational settings K-16. Any illumination on the function of instructional designers in K-16 institutions would be helpful to me as an educator. There is also the issue of academic freedom for faculty members, I am always a bit suspicious about uniformity-while it may be a good tool for management, I don’t see uniformity of course design as necessarily benefiting the range of students we get in our classes. “We have a fairly unique role at Kirkwood. We actually don’t design the courses – the instructors are the designers with Alan and I as their support team. With some new instructors, I meet with them weekly to guide and support them. With other instructors, I may only hear from them once or twice during the development process. It really depends on the instructor and the course. Thank you for your response. 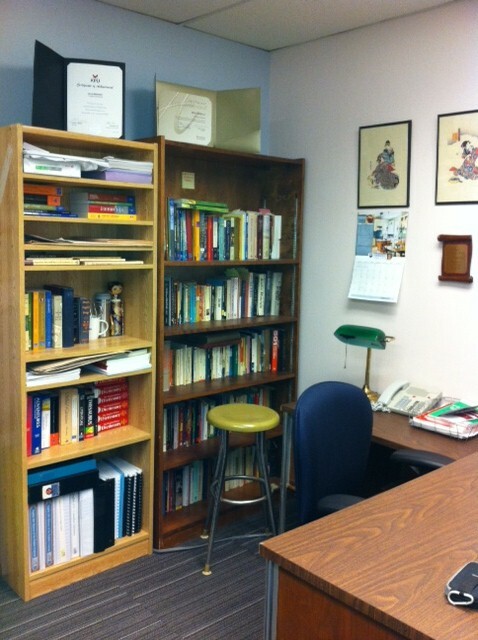 It is wonderful for faculty to have support available at an institution. We have been left to our own devices up to last year. Faculty mentoring has pulled us through some tough transitions to online delivery. 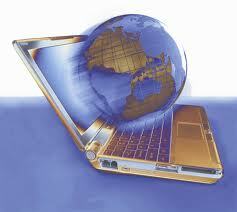 I have used many external webinars and programs such as this to learn how to teach online. I also put myself into the role of student and completed 4 years of education courses @SFU in Vancouver strictly online to experience the similarities and differences between delivery choices and instructor styles. I am now doing the same thing with Moocs- I am the guinea pig, and this is how I learn. One thing I wonder about is whether there will ultimately be fewer faculty members at institutions as online delivery increasingly goes to scale (Moocs- in whatever form). I had read somewhere that a prediction for the future of higher ed is that universities will have fewer teachers and they will be doing less. Do instructional designers play a part in this trend?? Discuss the implications for deadlines and due date structuring in your online classes. How do you plan to keep your students on track throughout your course? What sort of due date/deadline structure will work best for you and your students? My Moodle English courses are segmented into 15 week blocks with assignments due at the end of each week, usually Sunday evenings at midnight-giving the students the full week and weekend to complete work. My Moodle settings are configured so that students have a one hour grace period for submission, but no uploads are accepted by Moodle after the grace period. Sometimes, students will send their work to my email b/c they have missed the deadline, and I do accept the work as a special circumstance but not if the pattern repeats itself week by week with any single student. Over a ten year period of teaching this way online, I have to say that the consistency of weekly assignment due dates keeps the students organized. I have also learned not to overload students with work; this has meant very careful choices on my part when deciding which resources and activities to include when trying to maximize the learning outcomes. Perhaps the most troublesome semester is summer semester where students have registered for the online course but have summer vacation plans and miss some of the deadlines. I do send out deadline reminders to my students’ emails which they often access on their phones or tablets and they often thank me for the update reminders. The Moodle site also has upcoming deadline or due date reminders in the right hand margin of the website. I find that students need support with time and personal management, and I think that the Moodle LMS actually really helps students with learning management issues. I suggest that students access the course website 4 times a week, at minimum. I also check their activity reports and ask them to check their own activity reports-this is another online tool which is very useful for fighting procrastination. I will email a student who has not accessed the course website in any week. To be honest, I’ve taken vacations several times while teaching online. Most places offer Wi-Fi for free, so I’ve never had any issues. My students wouldn’t even know I was on vacation. I usually expect the same as them. This is the beauty of online learning. Anyway, the discussion point I was getting at here, was the idea of the working ahead policy. This can be troublesome if your class is discussion-heavy, but I know students like the flexibility. I personally let them work ahead as much as they want, but they are still required to meet the participation guidelines for discussions, so they may have to go back and do their discussion replies. You are right about the need for internet connectivity!! That is what I tell my students at the start of summer semester that it is still their responsibility to have internet connection even if on holiday for summer semester (and why does it matter where they are, anyway?). The excuses I get really indicate a mindset about educational assignments and ‘bricks and mortar’ institutions. In the business world, I think mobility it is far more acceptable and even conventional than in the educational settings. I too have traveled while teaching online. I sometimes have PD work out of the country. As far as working ahead, I only roll out the course one week in advance. When they open the course on the first day of the semester, they get a maximum of 3 weeks of the syllabus. I am taking several EdX and Coursera courses currently and I notice that the the courses on these platforms also unfold in this fashion. One of the reasons that I do not display the entire course at the start of the semester is that I like to switch things up each term, depending on how things are going with the students. I also teach blended mode at the same time as I teach my onlines, so I need to coordinate materials and I do a fair amount of creating of the course along the way. This also keeps things flexible and interesting for me as well. Where and When Does Learning Occur ‘Online’? You would think I had taken enough xMoocs or cMoocs in the past 2 years, but in my non- teaching semester this winter, I have added one more to the mix: Teaching Online: Reflections on Practice, a free open course offered on the Canvas Network by Kirkwood Community College in Cedar Rapids,Iowa. I was attracted by the title of this course because the teaching I do is ‘online teaching’ on Moodle LMS despite my professional development focus which now gravitates toward learning the skills of an open educator, working across internet platforms and creating the web. In an online course using an LMS platform, the course syllabus and course outcomes are largely controlled by the instructor (or institution) in the ‘walled garden’ of content uploads in the form of readings (req’d or optional), videos, discussion forum prompts, written assignments, quizzes, possibly blogs and group work assignments. Sounds rather like a traditional f2f class, no? I have been teaching English this way for over 10 years. It took me over 3 of these 10 years (a lot of sweat equity) to learn how to manage an ‘online course’ and successfully navigate the Moodle software using our institutional tech support. I spent hours searching, writing and curating materials, also streamlining my curriculum, responding to students’ questions, extolling the virtues of online teaching to colleagues and the like. My students adapted to the online environment, it seemed to me (identified through periodic surveys), more out of a practical need for scheduling flexibility (60% held part-time jobs) than an inherent desire to utilize or harness the internet for their learning. An online LMS course delivers ‘packaged content’ and the student learning occurs, I believe, predominantly through assignment submissions (internalizing course content-hopefully), subsequent instructor grading and feedback, computer graded quizzes, possibly some peer interactions through forums and maybe the inclusion of peer assessments. These are still very traditional metrics for learning assessments even though they occur online. For the most part, my English courses this summer semester will still follow this model which is, for the most part, teacher-centered. I have posted a .gif at the top of this post. It is of Jim Groom who sent out a challenge last summer in his course called Digital Storytelling 106 where participants in the open and ongoing (never-ending) course were invited to place the .gif of him on any backdrop. There were many creative submissions of ‘Dance Jim Groom All Over the World’. Below is my submission, somewhat amateurish, but in the process of creating on the web (virtually without a ‘teacher’) through many of the open connectivist Moocs I have engaged in- including #DS106 and Mozilla’s #teachtheweb– I have been ‘unlearning’ some of my standard teaching practices and learning innovative ways of embracing the internet, harnessing Web. 2.0 tools, and crowdsourcing feedback of my work-hopefully for inclusion in my future courses. In the past, I have been incorporating a significant amount of reflective thinking for my students (through readings and instructor-led prompts) about how the internet is changing or even disrupting how we learn in higher ed, but I am going to take this 6 week opportunity to reflect on how I can include more open educational practices for my students this coming summer term even as the institution binds me to the LMS. I read the following quote recently in 2011 World Economic Forum Report on “Global Talent Risk”. I would like to offer my students, in the confines of English as a subject, more learning opportunities where they can write as well as create digital artifacts, collaborate using social media tools, develop and expand personal learning networks, become more aware of digital citizenship and digital literacies, effectively curate their online content so that, in sum, they can develop ‘geographical and virtual mobility’-skills, I think they will need for their future working and social lives. Where and When Does Learning Occur ‘Online’? The world wide web is now our textbook or the biggest MOOC out there; learning can occur on the internet across multiple platforms; 24/7; students can learn asynchronously and synchronously to become networked learners. Here is 7th grader’s You Tube video about her personal learning environment which really resonates with me. Ally, M. (2004). Foundations of Educational Theory for online learning. In C. Anderson & F. Elloumi (Eds). Theory and Practice of Online Learning (2nd Ed, pp 3-32). Athabasca, AB, CA: Athabasca University Press. Aslanian, C. B., & Clinefelter, D. L. (2012). Online college students 2012: Comprehensive data on demands and preferences. Louisville, KY: The Learning House, Inc.
Brinthaupt (2011). What the best online teachers should do. JOLT, 7, 515-524. These are some of my ramblings on various lively discussion board forums while engaged in Duke University’s xMOOC entitled “The History and Future of (Mostly) Higher Education” led by Dr. Cathy Davidson, co-founder of Hastac. I did not take the weekly quizzes which many participants were acing without watching the video lectures and where most of the right answers were choice (d) all of the above. I also did not write essays which were peer reviewed in a Mooc of 16,000, nor did I participate in the final and ongoing project of “Building a University From Scratch”. I also did not pay for the Signature Track Option which would have given me a Certificate of Completion. Of the listed course objectives, I found only the first to have impacted my thinking. The takeaway value of the course for me was the opportunity to engage in provocative dialogue in some of the discussion threads; however, the organization of the discussion forums on the Coursera platform is in need of redesign. Understand how and why we inherited the Industrial Age educational systems. Think deeply about the requirements of the world we live in now. Discover new ideas, methods, competencies, and subject matter. Share our pathways to successful innovation with others around the world. Together, we can change schools, classrooms, institutions, learning–and maybe ourselves! How do I get attention? Janet: The Coursera platform is the problem with this course. I find the sheer volume of forum posts in the Coursera and edX courses daunting! This FutureEd course is however a bit better than a course I have just finished with edX. 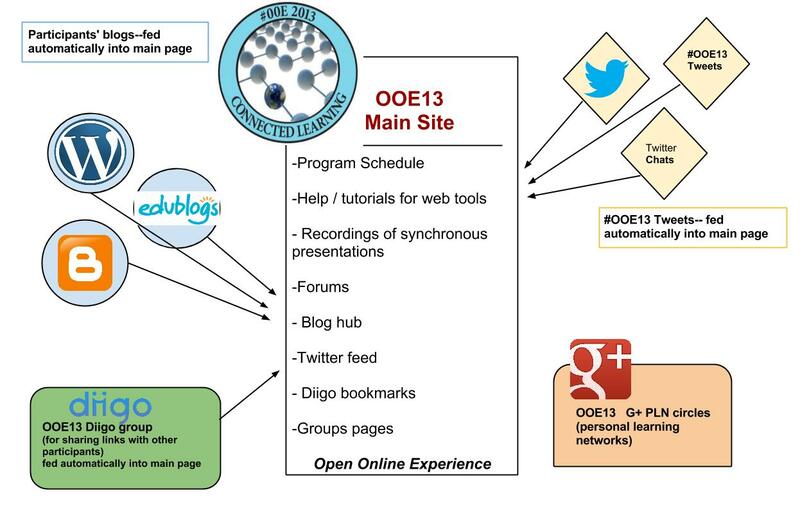 Janet: The chart I posted is the chart of a connectivist Mooc called Open Online Experience or #OOE13. The connectivist Moocs rely on blog postings for participant assimilation of course content, or the participants actually make up the course content and in that way there really is no ‘leader’ or star prof at the center and no predetermined course outcomes; although, a team is driving and monitoring the tech ‘behind the camera’ and co-mentoring in the program much the way the TA’s do in this course. ‘The community is the curriculum’, to quote Dave Cormier. You’ll notice that the hub of the cMoocs (on my chart) was a WordPress site into which blogs, twitter feeds, Google hangouts, G+ discussions were fed. The cMoocs are completely open! This #FutureEd course uses a Coursera platform and is essentially closed (password protected); It would be interesting to see a visual for the online ‘architecture’ of this course. I don’t think this course is teaching us about being open educators. Also, managing 16,000 participants couldn’t be an easy task!! Perhaps it is a bit too massive? I think it is important to know how to create on the internet, and that for me, at this time, is the most important thing to learn as an evolving open educator. 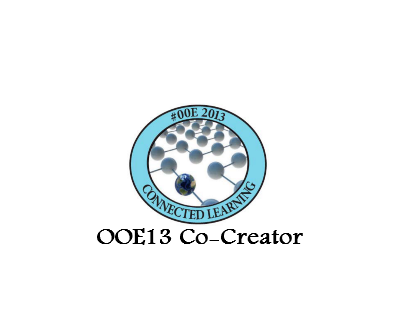 Making a contribution is exactly why I became involved in co- creating #ooe13. It’s been a lot of xtra work on top of my regular teaching duties but totally worth it and I’ve learned a lot. Our program which copied formats of other cMoocs ran several themes relevant to open ed practices with synchronous and asynchronous sessions each week or month. 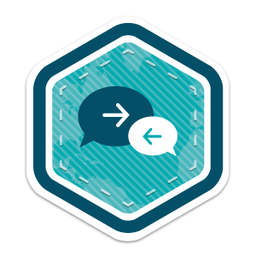 We had live events with guest speakers like Doug Belshaw who spoke about Open Badges. If you joined the live session you could ask Q’s of the speaker. If you missed the live sessions, you could access them on You Tube at your convenience. We held weekly Twitter chats on subthemes each week which also helped keep the program cohesive. Google hangouts too for those who wanted to connect in real time. I had never openly blogged before these cMoocs, but I have found that my own writing and the commentary I ( hopefully) get has been the key to my ‘unlearning’ of old practices and adaptations to new ways of communicating. You have to learn how to use SoMe for ed not by reading about it but by engaging with it, actively- as it all has a tendency to be very fluid and ever- changing. 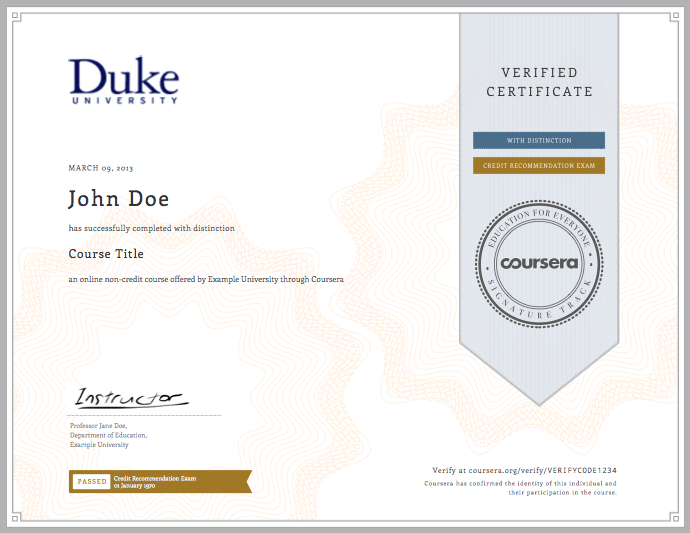 I’m not sure how much of a real contribution to open ed we can make in this course beyond crowd-sourcing ideas for Duke Univ. Or Hastac. I like making contributions at the local level, so I contribute my work to my univ in various ways- but participate in Mooc culture, widely. Readers of Christensen’s works will understand the bigger picture of what is happening to HE, globally. Changes to labor management within universities (adjunct vs tenure) are included in the technology / internet revolution we are undergoing. Universities have only recently begun to feel the ‘heat’ whereas other sectors of our lives have already made many of the tech transitions. Notice that this course has implemented a software (mentioned by Dr. Davidson- I forget the name of it) for marking essays-this is the future! In some cases, adaptive technology may do a better job than a professor of individualizing the learning experience for the student. It is curious to me that Coursera and EdX rely so heavily on star professors for content delivery of their courses (lecture capture, basically). I’ve also taken an Edx “Justice” course by Prof. Sandel and the format is the same. These Moocs (Coursera, EdX) are termed xMoocs, while other more decentralized Moocs are called cMoocs=c is for connectivism, and the cMoocs offer a more decentralized model of online learning, using the community as curriculum-the learning occurs through the engagement of participants- dialogues, blogging, resource development and sharing. I am using myself as my own guinea pig and taking many different types of Moocs to see how I learn and how the Moocs are structured. So far, what I value the most in any Mooc is the interactions I have with fellow Moocers. I think it is very possible to have a networked community online which replaces the classroom experience of a f2f learning community. I really believe that university instruction these days must adapt to the use of tech and the internet-even if in blended modes. Thank you, Anonymous, for posting your article! Enjoyed it! If you have the time, watch this 2014 World Economic Forum Roundtable on the Value of a Higher Ed Degree. Janet: Hi Alex-A relatively new liberal arts university in Squamish BC, Quest University applies what you term ‘clinical’ faculty roles-multiple year contracts available after the initial probationary period. If anyone listened to the CBC podcast I posted, the overspecialization of fields within universities is problematic for long-term faculty employment prospects, but some fields such as Schools of Business are doing well and hiring right into tenure track. The Humanities have suffered the most across the board in NA for the proliferation of contract faculty hires. In Canada, 50% of the faculty in all universities are contract faculty. *Also see my blog post on the topic of the role of faculty. I don’t know whether my post is helpful to the thinking here, but I found this quote in the 2011 World Economic Forum Report on “Global Talent Risk”. Thought it summed up the reasoning behind programs such as #OOE13 , #EtMooc , #xplrpln, #DS106 , #Rhizo14 , #teachtheweb, #FutureEd. I do think it is important to credential people (maybe badges?) who participate in these online c or x Moocs at any level (even ‘lurkers’ who are Mooc beginners). I have now taken all of these programs, can say I have actively participated- but have no credentials, yet I have really learned about ‘virtual mobility’, have expanded my PLN, ‘created on the web’, and have read & offered many insightful posts (all public- on G+, Twitter, blogs). Yes, I have learned as I slowly reinvent myself as a teacher or open educator. Oh, I did get one badge from Wide World Ed (U. of Athabasca, Canada) and one from Open Online Experience 2013 as co-creator. I also took the EdX ‘Justice’ course-was my first xMooc. I really enjoyed Prof. Sandel’s lectures (philosophy is my bckgrnd, so was a nice refresher); found the quizzes challenging as well, but passed them and received my Cert. I have used a few of the lectures (avail. on You Tube) in my English courses. 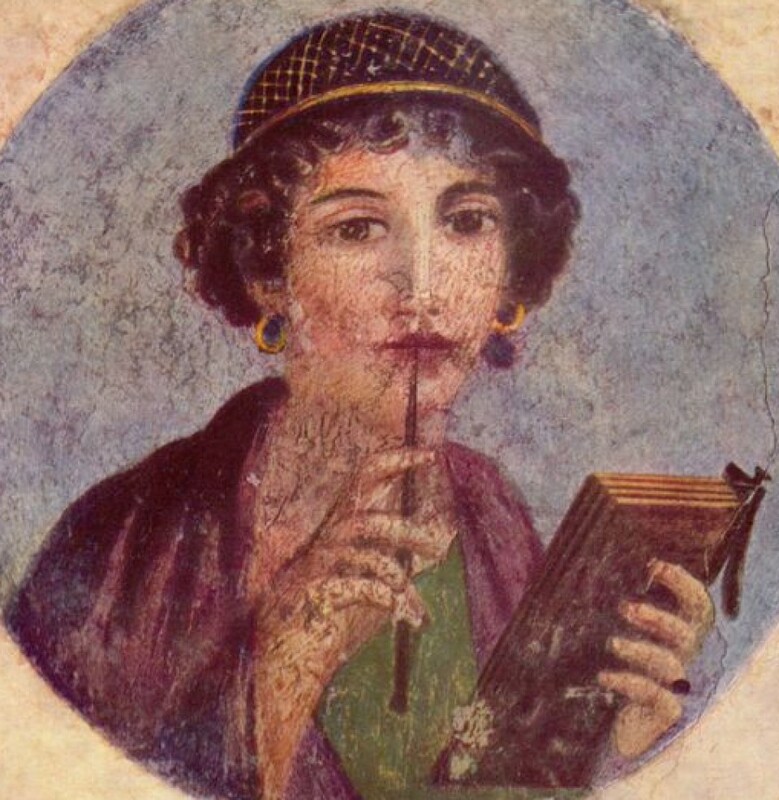 Also, just finished another EdX course on ‘The Letters of Apostle Paul’-Harvard- Professor Laura Nasrallah is top notch-very academic content, good critical inquiry / historical focus, and some cool tools like collaborative annotations using Poetry Genius for all the readings. No quizzes-only discussion forums (How could you get’ right’ or ‘wrong’ answers interpreting Biblical text?). 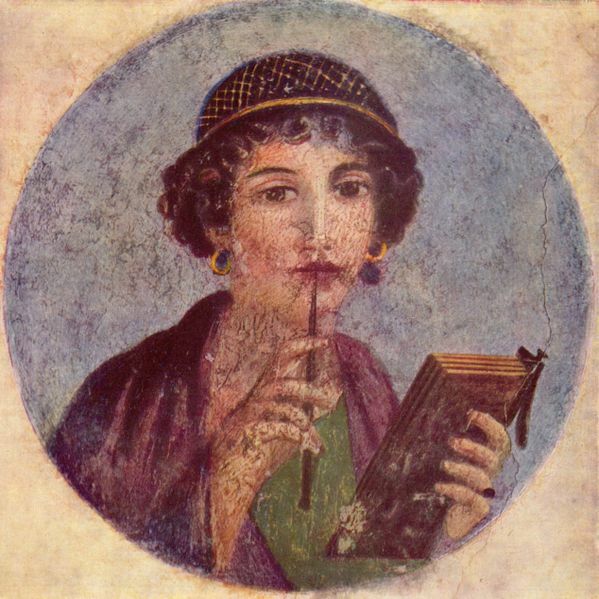 Some very interesting interviews offered in the course with leading researchers of antiquity and ancient text. I took the course for my own life-long learning, just curious-not for theological reasons. Higher ed has felt the sting too of this assault with increasing ‘accountability measures’ on faculty and a burgeoning and well paid admin. while 0 – negligible wage increases for faculty for nearly 10 years!! Here is a good session with Charlie Rose on the MOOC Phenomenon. Thank you to Dr. Cathy Davidson and her TA team and ‘behind the camera’ team for their risk taking in offering this course worldwide to 16,000 participants!! Let’s see if I can combine a few ideas in this blog post as I engage in several ‘c’ and ‘x’ Moocs* during my non-teaching semester. Dave Cormier invites us to consider community as curriculum in the P2PU course “Rhizomatic Learning” and Dr. Cathy Davidson invites participants to think about ‘Neoliberalism and the Defunding of Public Institutions’ in the Duke / Coursera course on “The History and Future of (Mostly) Higher Education”. Both courses are Moocs of sorts and both use social media platforms such as Google+, Facebook and Twitter to enhance accessibility and interaction among participants. The discussion forums in each course are provocative, engaging and offer a wide range of perspectives because of the worldwide representation of participants. Dave Cormier’s weekly prompts are delivered on You Tube in about 4 minute bytes or less and Dr. Davidson’s lecture captures, lasting approximately 20 minutes each, are embedded within the Coursera platform and are downloadable along with a readable transcript or ‘cue cards’. Coursera’s organization includes a team of Duke University TA’s who monitor and frequently comment on the discussion boards and are available for online office hours to field questions; it is not clear whether Dave Cormier’s course includes additional human resources other than behind the scenes technical support for the various online platforms used for the P2PU course; although, the Google+ Community indicates 2 mentors embedded in the participant list. The Rhizomatic Learning course is an exercise in the community as curriculum, online, because the course content emerges from the blog postings, resource production / sharing and social media discussions ensuing from Dave Cormier’s thematic prompts on education. The Coursera content has been predetermined to a large degree and is delivered through videotaped lecture format, along with quizzes and essay writing / peer review requirements for a certificate-a more traditional approach, albeit in an xMooc format. Certificates are not offered in Dave Cormier’s course; although, there is a badge available- but the course community is very active and the flurry of weekly blog posts attest to the interest level participants attach to engaging with their established and growing personal learning networks. One of the #FutureEd discussion forums I have engaged in this past week has tackled the thorny issue of adjuncts vs. professors in higher education as a subtheme in the thinking about the role of university faculty and labour relations for the future. It is no secret that the percentage of courses taught by adjuncts has increased dramatically in most post secondary institutions in North America. According to a January episode of CBC’s “The Current” entitled “The income gap between tenure faculty and adjunct contract professors in Canadian universities“, 50% of the faculty in all Canadian universities are contract (adjunct) faculty. In contrast, a #FutureEd discussion forum participant from Australia notes that in the system where she works, university degree programs can only be delivered with a 10% ratio of sessionally paid staff. She cites the Enterprise Bargaining Agreements in place for most Australian universities which ensure that there is an upper limit to the amount of replacements of fulltime academic staff with casual labour. Other participants cite experiences of having taught for many years as adjuncts but with continued employment because of the demand of their subject matter and/or experience in the field. Some adjunct faculty members only contract out their teaching services to universities as they continue full-time employment within their fields. My own experience is a combination of the above; I was able to piece together full time employment over a 15 year period as a contract instructor for several institutions until I was finally regularized (rather late in life and as a second career) into a full time position at Kwantlen Polytechnic University where I continue to teach full-time today. James L. Turk, Executive Director of the Canadian Association of University Teachers, speaks in 2012 about “Universities in Crisis” and outlines new trends in the corporatization of public universities where every department is under pressure to be a profit center in an environment of decreasing public funding -effectively privatizing public post secondary to the detriment of students and their debt loads. The #FutureEd course re-examines the traditional model of higher education raising questions about the role and value of faculty. James Turk speaks about some of the pernicious language changes within some universities as institutional missions and priorities change from a ‘public good’ to a private one; he cites language shifts such as ‘customer service’ replacing the word ‘education’, or ‘clients’ replacing the word ‘students’ and ‘service providers’ replacing ‘faculty’. In the extreme, he cites Prince George Community College in Virginia, USA where all faculty members have to wear a badge reading “Have we served you well?” On the surface it may seem that the use of casual labour in higher education helps the balancing of university budgets, but is it a good thing for higher education and how does the use of casual faculty labour affect the students’ education? Here is a 2013 US Congressional Report submitted by a #HigherEd participant offering anecdotal evidence that difficult working conditions of adjuncts are negatively affecting student education. Another #HigherEd discussion forum participant emphasizes that colleges and universities should be clear about what the career opportunities are at their institutions, particularly for those applicants who want to teach full-time. Having served on search committees and having completed many peer reviews of probationary faculty members, I understand that there is very likely an expectation of future regularization when an applicant accepts a sessional position at a post secondary institution; however, the reality may be a lack of future opportunities especially in the shifting sands of current university re-structuring and program defunding within a 21st century internet revolution. Teaching, service, research. These are the three performance criteria by which post- probationary faculty are evaluated at my polytechnic university. Kwantlen Polytechnic University was historically a community college and is now designated a ‘teaching- intensive university’ -provincially mandated in 2008 through the Amended University Act of BC to ‘serve’ its region. A contract instructor (sessional or adjunct) at my institution generally does not engage extensively either in institutionally supported research or in faculty governance and curriculum development activities (no requirement). As one #FutureEd participant notes, apart from the poor working conditions and the effect on student learning, adjuncts generally don’t have long term influence on departmental or institutional curricular choices yet are disproportionately responsible for implementation. Therefore, a disproportionally high percentage of adjunct teachers within an institution can compromise the traditional ‘shared governance’ structure and academic freedom of the university. James Turk has pointed out in his talk that some of the administrative-led restructuring of programs and priorities at Canadian universities have included what he terms ‘administration creep’ (the proliferation of administrative staff and concomitant reduction of faculty members) and the ‘undermining of shared university governance’. A Community TA of the #FutureEd course advises that many adjuncts continue with demeaning working conditions at a university because of their subject area passions and ‘love’ of teaching, This article submitted to the discussion forum entitled “In the Name of Love” by Miya Tokumitsu offers a bold perspective on the issue of being distracted from the working conditions of our colleagues through DWYL* thinking. Tokumitsu writes, about the division of DWYL thinking: “Work becomes divided into two opposing classes: that which is lovable (creative, intellectual, socially prestigious) and that which is not (repetitive, unintellectual, undistinguished). Those in the lovable work camp are vastly more privileged in terms of wealth, social status, education, society’s racial biases, and political clout, while comprising a small minority of the workforce.” * Tokumitsu also cautions that adequate pay and job security can become afterthoughts in Academia if contract faculty accept the poor working conditions associated with their pursuit of intellectual fulfillment and if institutions increasingly employ exploitative labor conditions. Most of the #FutureEd discussion forum respondents agree that institutions which traditionally have made binding commitments to their faculty, administrative staff and students through fair labour practices have created a sense of community within their regions; this institutional allegiance is often very important to alumni relations and endowments to the university. Succession planning at an institution also depends on the successful recruitment and retention of new faculty members who can be mentored into the institutional culture and who can assist with progressive changes needed for educating 21st century learners. University administrators who have focused on the ‘community-oriented’ aspects of teaching create institutional loyalty, writes one respondent. Respondents also question whether the flag of “professor” or “adjunct” is a fair measurement of teaching capability? There is probably no easy answer to the question of whether adjuncts are good for the university. There are a lot of great teachers working as adjuncts and there are probably some less than great. The same is probably true for tenured faculty. Ideally, by providing job stability, the university can nurture faculty members who develop a sense of professional accomplishment on top of the increasingly demanding content-knowledge and teaching skill requirements of today. Human resources, connections, stability, decent salary with benefits are all features of a job that traditionally had a lot to do with the successful completion and transfer rates of a school. A #FutureEd participant describes the scenario of a full- time position where having a campus office meant online and seated students could ‘come and visit, talk about content, skills, and often their lives’. A good deal of internal liaising has also occurred in this scenario on behalf of the student’s academic and career goals. In contrast, another respondent offers that the colleges which survive the second half of this century will have to focus on educational counseling and assessment services for life-long learners and disaggregate the services currently offered by tenured professors. Institutions will need a new compass for community or regional stakeholders as MOOCs and other innovations broaden the institutional reach. So, where does this leave us? The internet revolution will bring changes to higher ed labour management, new possibilities and unpredictable job opportunities and possibly job losses. Many of the coming changes in higher ed may create more teaching or mentoring opportunities, but it is likely that many of these opportunities may be outside the conventional ‘bricks and mortar’ of the university setting (check out this EdX job website!). The idea of ‘teacher status’ may also become irrelevant in a digital age where de-centralized models of education such as the connectivist Mooc are being experimented with- free, online and at scale. Many tenured professors are experimenting with x and cMooc course delivery outside of their regular teaching duties. As an example of alternative course delivery models, my university recently became a member of the OERu Consortium (UNESCO supported). OERu is devising a corps of worldwide ‘academic volunteers’ for course delivery-essentially, no pay for ‘teachers’. Course services (like open assessments) will be disaggregated and charged out by the university on a ‘fee per service basis’. At scale, this will mean more profit per ‘course’ delivered without faculty salaries / benefits or ’bricks and mortar’ overhead costs while new markets are established. Here is a model of the OERu Consortium; note that students can access support for their course work through “Academic Volunteers International” in a sense very much like the TA support structure available at #FutureEd . Additionally as an example of the profound institutional changes and very palpable defunding of public post secondary education in British Columbia, my university’s senior management recently made the decision (without Faculty Council approval) to cut 1600 student spaces, or 98 sections, of access education with a loss of 14 regular faculty positions (layoffs) and the loss of many more adjunct positions in the Faculty of Academic and Career Advancement as a result of a federal cancellation of a program which supported university access within the post secondary sector in British Columbia. Regular, tenured positions are no longer secure in an environment of post secondary funding cutbacks by governments even as institutions shift their priorities, re-write their missions and form new global alliances such as the OERu Consortium, Coursera or EdX platforms. The idea of an institution’s regional community is in transition, and the traditional role of higher ed faculty is in flux; I think it is too late to try and fight for a status quo which existed even ten years ago. I will end this blog post with a link to a Storify created midway in Dave Cormier’s course entitled “The interpersonal contract in cMoocs”. You will notice that Dr. Cathy Davidson has been included in the story! The interactions and discussions of educators pushing boundaries of ed delivery occur on Twitter, Google+, blog posts, You Tube. Participants are teaching each other, openly; the online community of innovative educators is the curriculum, but possibly this online ‘community’ is also redefining the role of the faculty in higher education. *Thank you to the #FutureEd discussion forum participants who prompted my thinking on this topic. *For an explanation of evaluating a cMooc using Downes’ 4 Process Conditions, see Christina Hendricks’ blog post. Anyone interested in Simon Fraser University’s seminar on a Living Wage University, here are the details. Thu, 27 Feb 2014 12:30 PM West Mall Centre 3510 SFU’s Burnaby Campus Event is FREE, but registration is required at https://websurvey.sfu.ca/cgi-bin/WebObjects/WebSurvey.woa/wa/survey?158954933. This lunchtime talk, hosted by Professor Marjorie Griffin Cohen of SFU, will give you the opportunity to learn what a Living Wage University is. Many universities around the world have passed a ‘Living Wage Policy’ ensuring that all staff and contracted service staff receive a Living Wage; that is a wage to ensure a family can cover its basic needs. By taking on this leadership role they have demonstrated how universities can lead by example in a very practical and inspiring way in tackling issues of growing inequality and rising levels of child and low wage poverty in our communities. This talk will hopefully stimulate discussion and debate about how universities in Canada can take similar leadership positions on this issue.